Houston attorneys Chris Tritico, left, and Arthur Schechter served as guest speakers in adjunct Professor Michael Solar’s class at the University of Houston Law Center. 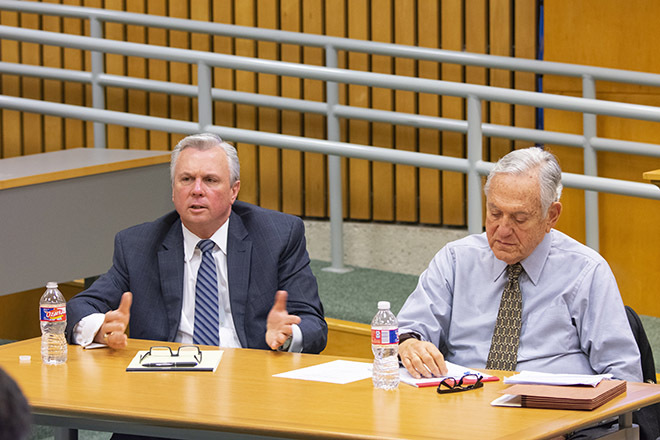 Feb. 5, 2019 — The careers of Richard "Racehorse" Haynes '56, John O'Quinn '67 and Joe Jamail were recalled during guest lectures recently in University of Houston Law Center adjunct Professor J. Michael Solar's class, "The Modern Day Trial Lawyer: Redefining Trials & Trial Lawyers." Christopher Tritico, a founding partner at Tritico Rainey, previously worked as an associate with Haynes. He was a part of the defense team that represented Timothy McVeigh in the Oklahoma City bombing case. He credited Haynes' ability to work slowly and methodically during cross examinations with witnesses. "What Richard knew was to take it slow and be respectful of everyone," Tritico said. "I never once saw him raise his voice in a courtroom. "The things the jury should be looking at and listening to is not the witness -- it's you. You are the director of the play and the information. Richard knew that innately. The witness is only there to convey, but you are the one directing what information the witness is conveying." Tritico said the character traits that made Haynes a great trial lawyer were his passion and faith in the justice system. "You have to be very passionate about what you do, especially in criminal defense. If you don't believe in what you're doing, then you're not going to be able to represent the criminal accused. You need to be able to separate the facts from the Constitution. Our job is not to ask, "Did you do it?" Our job is to ask, "Can they prove it?" Arthur Schechter, a founding partner at Schechter, McElwee, Shaffer & Harris and a former U.S. ambassador to the Bahamas, discussed the career of O'Quinn, for whom the Law Center's library is named. "His passion was always to try to help the underdog," Schechter said. "His talent for memorizing huge amounts of information and recalling it instantly helped him greatly, as did his urgent competitive edge where he had to be the best, the brightest, the most successful or nothing at all at any cost." Solar, a 1980 Law Center alum, highlighted Jamail's monumental career, which was defined by the famous Pennzoil vs. Texaco case in 1984. "Joe was special in the sense that he was a ferocious advocate," Solar said. "He was ultimately nicknamed the 'King of Torts' and was characterized as being a one-off and a genius at his craft. The New York Times reported that in over five decades he won more than 500 lawsuits and $13 billion in judgments and settlements for his clients." Solar's course analyzes if the characteristics of classical trial lawyers are relevant in a time where jury trials continue to diminish. "The course analyzes, and the class discusses whether or not classical trial lawyer characteristics and skills are even relevant in an age where less than two percent of cases filed are tried to a jury verdict," Solar said. "The new reality is that trial lawyers have increasingly become litigators. A mediator is the new judge, and the mediator’s office is the new courtroom. This new era of glorified litigators tests our ability to maximize recoveries for our clients through increasingly sophisticated arbitrations, mediations, or private trials."